Alliance Trust Savings will likely appeal to longer-term investors in search of discounted fees; however, this comes at the expense of a particularly poor overall client experience. Alliance Trust Savings is one of the UK's leading financial service providers for private investors. It is an independent business, but a wholly owned subsidiary of Alliance Trust PLC, one of the largest general investment trusts (by market value) listed on the London Stock Exchange. The company was incorporated in 1888, but its origins go back to 1873 and the founding of The Oregon and Washington Trust Co Ltd.
Alliance Trust Savings began in 1986 as a savings scheme for shareholders of The Alliance Trust and The Second Alliance Trust. However, after the launch of PEPs (Personal Equity Plans), it effectively evolved into an investment trust supermarket, in which investors could not only hold Alliance Trust shares, but also shares in other companies. The Alliance Trust brand markets dependability and security from a deep and rich history. It is listed on the London Stock Exchange (ticker ATST) and is part of the FTSE 250 (the 250 largest UK stocks outside the FTSE 100). 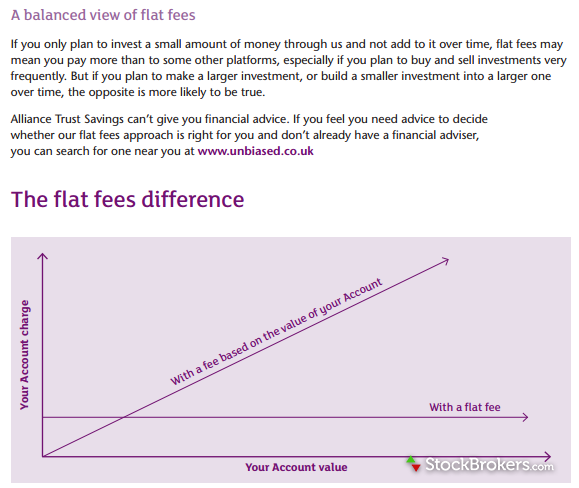 Alliance Trust Savings trading fees are just below the average when compared to its competitors, at £10 per trade. Furthermore, the low account management charges – a flat rate of £10 per month, regardless of the size of the holdings – represents a significant saving for those who invest through an Alliance Trust Savings account. Most of the company’s competitors charge between 0.25% and 0.45% per annum for holding funds. The Alliance Trust Savings research section is run primarily by third-party providers. While this is prevalent in many UK online brokerage firms, the lack of any further significant and independent research is disappointing from a client’s perspective. 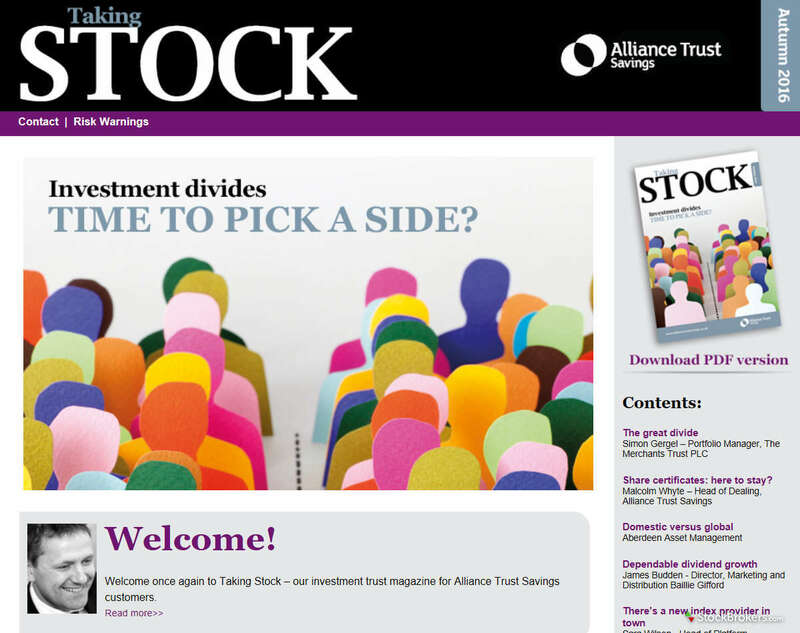 Although Alliance Trust’s independent articles are clear and concise, they are delivered sporadically and lack depth. The company’s quarterly magazine, “Taking Stock,” is a somewhat standard provision in the industry and not particularly useful for detailed research needs. Alliance Trust Savings does provide third-party research, which includes offerings from Morningstar, Edison, and Shares Magazine. Morningstar's external research is always impressive, and is available to Alliance Trust Savings clients and non-clients. Furthermore, Alliance Trust Savings features a link on its website to research provider Edison, so this information is available to account holders and non-account holders. In conducting our trials, we found access to the research section of the website extremely unreliable, to the point that the research section crashed repeatedly on various browsers, which was very frustrating. Finally, there is a weekly online update, Weekly Share Tips (which comes from Shares Magazine) that can be delivered free via email. In summary, the research from Alliance Trust Savings is provided largely by other companies. While the research is useful, it is readily available without having an Alliance Trust Savings investment dealing account. 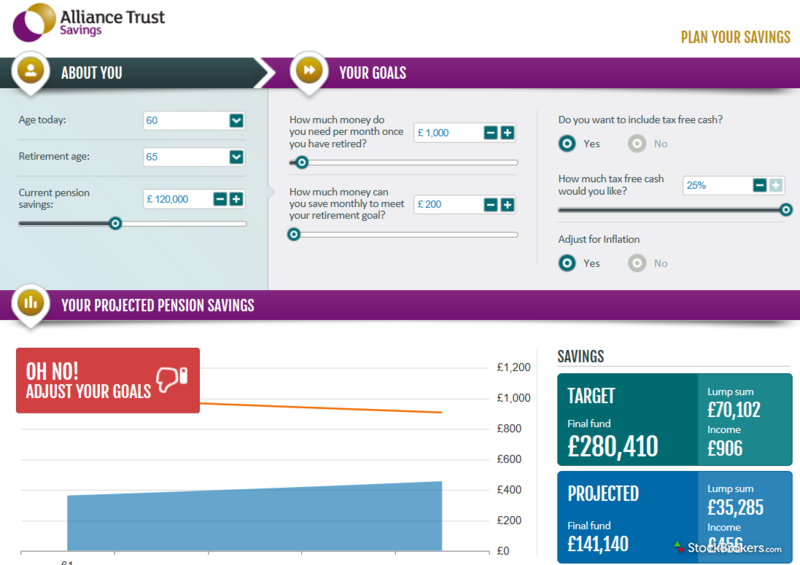 The Alliance Trust Savings trading platform and technical analysis tool are adequate, but provide a rather average user experience and are far from inspiring. As mentioned above in the research section, the technical analysis and charting research platform is provided by Morningstar and is available to clients and non-clients (though the experience is slightly more user-friendly from within the account portal). The technical analysis/charting platform (courtesy of Morningstar), does allow users to switch chart types, and allows users to add an index overlay or indicators and studies (there are no drawing tools, unfortunately). From a trading perspective, there is zero connectivity between the fundamental and technical research platform (Morningstar) and the trading platform. There is no ability to trade from the chart and no means to set up alerts. In summary, the technical analysis tools available are average at best and delivered entirely by a third-party provider. Furthermore, these tools are not incorporated in the trading platform, which has hardly any extra tools. Alliance Trust Savings does not provide any mobile trading applications on iPhone, iPad, or via the Android store. We find this quite extraordinary, given the company’s position as a significant UK provider of online investing and trading. Alliance Trust Savings should have a suite of mobile trading applications to compete meaningfully in the online trading environment. The Alliance Trust Savings education section is particularly limited. The Alliance Trust Savings education section is particularly limited. There are a handful of downloadable key facts and user guides. However, these are brief, lack depth, and are mostly specific to Alliance Trust Savings. There is hardly any other generic education regarding investing or trading, and very little specific educational content. 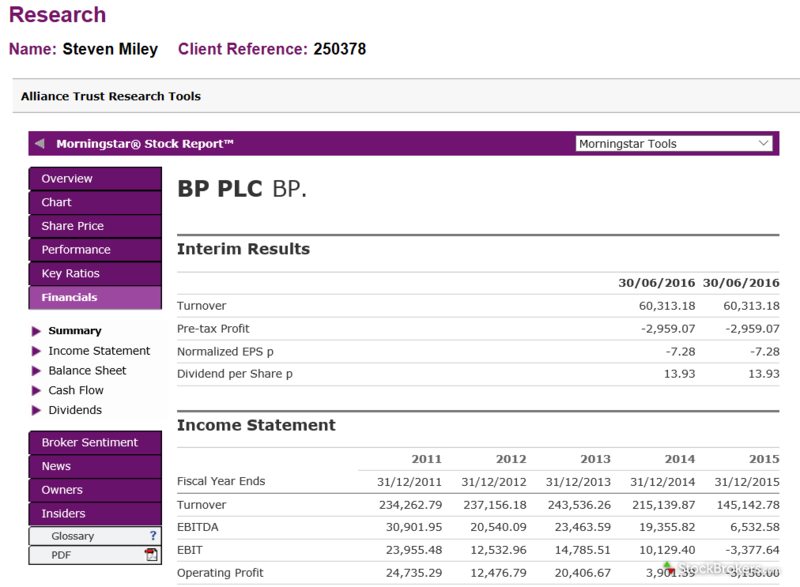 On the plus side, though, unlike some of its competitors, Alliance Trust Savings does provide three investing calculators: a savings calculator, a pension calculator, and a retirement calculator, which are useful from a broader investing perspective. Nonetheless, these calculators are not particularly useful when making specific investment decisions. Overall, the limited amount of educational content from Alliance Trust Savings, the absence of any multi-media education, and the lack of depth of content is disappointing. The low monthly account holding fee of just £10.00, regardless of account size, makes Alliance Trust Savings attractive to investors with large portfolios. This is particularly true if trading turnover is on the low side, with trading fees at the high end compared with completion. For a high-turnover trader with a relatively small investment, though, the benefits of the flat rate holding fee would be quickly outweighed by trading costs. Commissions aside, the client services team was particularly responsive and knowledgeable in our testing (even though no weekend support was offered). That said, we are not impressed by the fundamental lack of research, the poor charting package, and the unimpressive trading platform, which does not facilitate executing investments and trades. The non-provision of any mobile applications is also very disappointing. If your main aim in choosing an online broker is to ensure low commissions and fees, then maybe Alliance Trust Savings is for you. 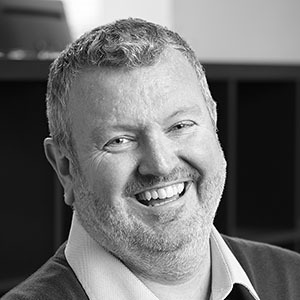 But the million-dollar question is: are the discounted costs worth the shortfalls we have enumerated above in the client’s overall experience with Alliance Trust Savings. Select one or more of these brokers to compare against Alliance Trust Savings. Trading Fees - The online share dealing charge is determined by the time the account has been open, so a loyalty discount is applied; if you have continuously held an account for 5 years or more you qualify for a loyalty discount. (including UK or overseas shares, ETFs, gilts, corporate bonds, VCTs and investment trusts). £10.00/ month, which includes 4 online trades a year. £17.50 plus VAT a month (whilst you are saving). £23.75 plus VAT a month (once you start taking an income). Find out how Alliance Trust Savings stacks up against other brokers.